is the inspirational lady behind the project, with which we are so proud to be involved. The Air Cadets Junior Leaders Course is physically and academically demanding and requires real commitment and determination. The course which culminates in the award of a Level Two Certificate in Team Leadership from the Institute of Leadership and Management is the toughest but most rewarding of the Air Cadets leadership courses – any Cadet that makes it through has the makings of a very successful leader. John was fiercely proud of his link with this great course and the JTYAF is privileged to have the opportunity to continue that support by assisting in the further development of these talented young men and women. 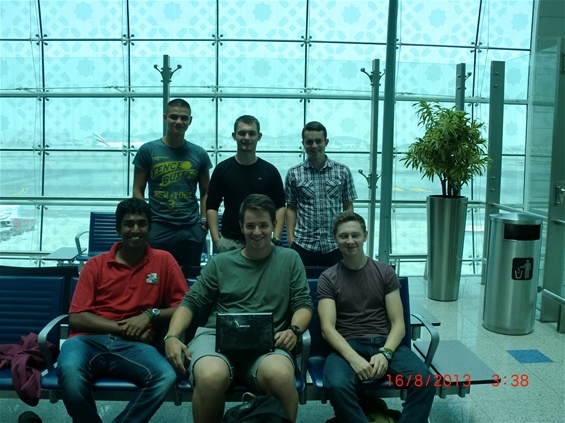 Samuel Jackson, Luke Womersley, Harry Clubb, Jordan Cawer, Lawrence Page and Christopher Raj (pictured at Dubai Airport on the journey out) were selected for the Kenya expedition based on the quality of their applications and their performance on the course. They recorded their experiences while they were in Kenya in a blog which gives a real insight into their work, the ups and downs and above all their achievements. The JL 2013 expedition blog closed with these words "This trip has been a dream come true for us and will leave us with many happy memories. We hope we have made you proud and lived up to your expectations. Still continuing to climb as high as we can dream..."
We are extremely proud of the 2013 JTYAF Kenya Team, they have achieved so much and made a difference to the lives of literally thousands of people living in poverty. At Grace's Care Centre, home to more than 60 orphans and a school for hundreds of children, the local authority had issued an order to renovate the kitchen otherwise the centre would be closed. They were also in desperate need of desks and chairs for the secondary school children. Phase 2 of the project moved to Kisii in southwestern Kenya where the group were joined by 5 doctors, 2 pharmacists, 2 dentists, 2 opticians, 1 women's health nurse, 1 laboratory technician, 4 translators, 4 drivers and vans, 2 armed police and 2 tents - mobile medical clinic ready to go! It is evident that Patchworking Against Poverty is making a huge difference to the lives of thousands of people living in poverty in Kenya and the JL's are playing a very important role in the project as Laura explains. "Kenya was and always is a big adventure, this year we were able to provide Wema with a drainage system, a new store room, a new incinerator and a new assessment centre which we hope one day to house an X-ray machine in. Graces care Centre houses over 60 orphans and provides a school for hundreds of children living in poverty, they were told to renovate the kitchen to comply with government regulations otherwise they would be forced to close. The were also provided with school desks so they could start term with somewhere for the new secondary school pupils to write on. Kisii medical camp was awesome. We worked together as a group and saw over 4500 patients in 6 days. The JL's settled in great with everyone and were able to provide essential help with the running of the camp as well as keeping spirits high! Without the JL's dedication, constant commitment and hardwork in Kenya we would not have completed these projects. I was proud to take them out there, they showed respect for the community and for the projects JTYAF and Patchworking Against Poverty are part of." If you would like to learn more about this fantastic project and what was achieved this year please watch this.